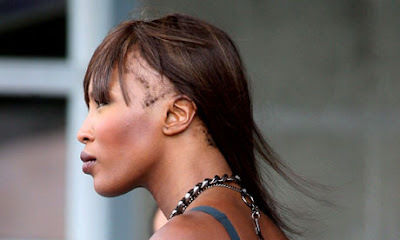 What's wrong with Naomi Campbell's hair? Some might consider it karma, but it's hard not to feel at least a pang of sympathy for Naomi Campbell. Speculation about the state of the model's hair underneath her extensions has gone on for years, and new photographs appear to confirm that she is suffering from a severe case of traction alopecia. "Tight hair styles, ponytails, hard brushing and hair extensions can all lead to traction hair loss, which happens due to constant pulling on the hair follicles," says trichologist Philip Kingsley. Campbell's extensions habit is hardly surprising. In a world where long, blonde, straight hair is still seen as more beautiful than curly black Afro hair, many black women opt for extensions and weaves (where your own hair is braided and extensions are sewn in on top). 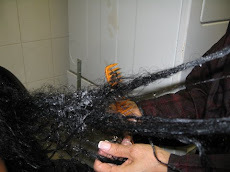 Ironically, this is often because they want to give their own hair a break from the trauma of straightening, but when extensions are poorly applied or worn for too long, they can be just as damaging. "Extensions are OK but not on a full-time basis," says Joy Miller, co-founder of the Junior Green salon in Knightsbridge, which specialises in Afro and European hair. "Over time hair can only take so much, especially along the hairline." Rather than covering it up, Campbell should take her extensions out immediately, and visit a trichologist for scalp treatment. "But because of her job it'll be hard for her to do that," says Miller. "Even if she started wearing wigs, the pressure on the hairline might be too much."